The snows have been good this year, keeping snow leopards to the lower elevations, and closer to tourist camps in the Husing Valley of Hemis National Park. 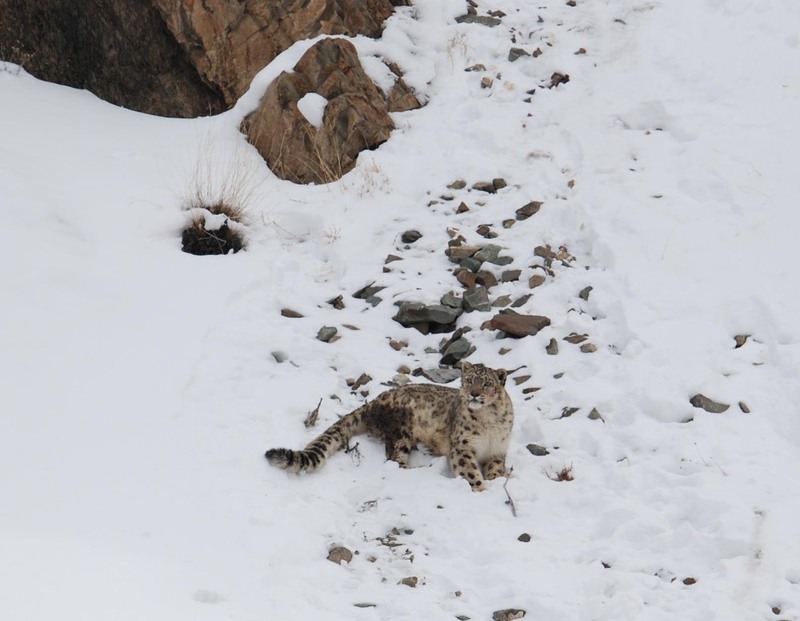 Hemis is truly the Snow Leopard Capital of the World, thanks to protection by the J&K Wildlife Department and local villagers who now perceive the cat as an asset instead of a pest to be eliminated. It had been over three years since I visited Hemis with one of our special Winter Quests for the Snow Leopard, which we have been offering since 2005, in partnership with KarmaQuest Ecotourism & Adventure Travel. This winter we have two groups, and I joined the first near the end of their stay in the Husing Canyon tented camp along the main trail leading to the small hamlet of Rumbak. This community is the protector of one of the world’s rarest cats. 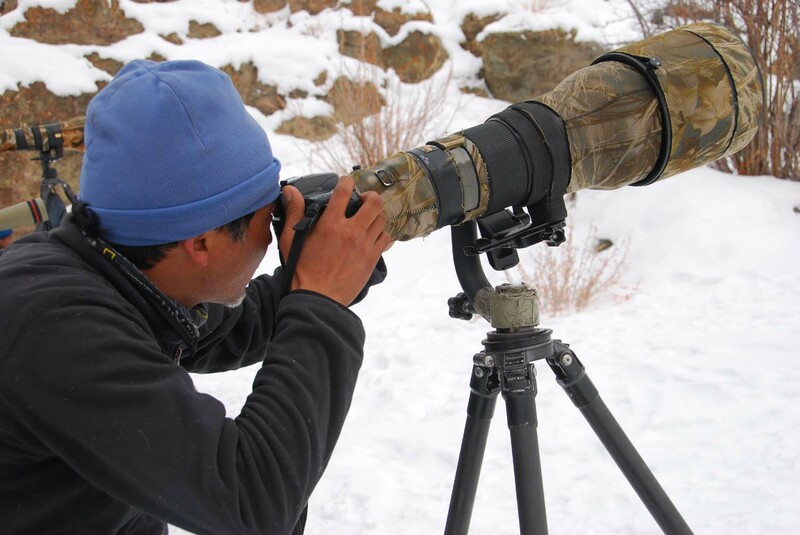 Under the diligent guidance of SLC-India Trust’s Jigmet Dadul—whom many consider to be the world’s best leopard spotter—Brian and his wife Pam, Karen, Katrina, Gaye and David had the amazing run of six snow leopard sightings in four days! On Day One, they watched a female and two nearly full-grown cubs crossing a high ridge, and an adult male, possibly the dominant cat of the area, resting on a rocky outcrop. The next day they saw a snow leopard moving upslope above the Husing poplar tree plantation, and the following morning they saw another cat on the slopes immediately above camp. Wow! In the 1980s, when Darla and I started our work on snow leopards, this would represent 3-4 years worth of sightings. I was also in luck. Within 15 minutes of arriving at camp around noon on February 14th (Valentine’s Day, and peak mating season for the cats) my eyes were glued to a spotting scope taking in a minutely detailed male snow leopard happily asleep on a sunny knoll high above the “camp,” and watched by about 25 excited tourists. Actually, there were three separate trekking groups, ours, another comprised of 6 or 7 members and one of 17. The latter were professional photographers from South Africa (with massive 700m + camera lenses), and travel agents from around the world. Fortunately two park wildlife rangers were there to ensure that no one got too close to the cats. Though the people were a good 250-350 meters away on a nearby ridge, the mass of human eyes hovering over tall tripods and long lenses surely presented a somewhat intimidating image to the cat. In typical cat fashion, he would periodically flick his tail several times, only to fall over and sleep for 10-15 minutes—before some movement from the tourists caught his attention, and he would abruptly sit up and stare intently. We returned the following morning, not really expecting her to still be there. But she was! And we enjoyed the privilege of spending 6-8 hours quietly observing her alternatively feeding, resting or chasing those pesky magpies. Clearly, this cat was not about to share her hard-fought meal with any bird, yet she was prepared to tolerate 20 humans watching her every move. I could not but marvel at her tolerance of the over-abundance of two-footed critters. Perhaps this is because so few snow leopard hunts actually end in success. Enjoying the hospitality of a homestay at one of the Rumbak family’s a few days later, I thought back on the 5-8 years it had taken the Snow Leopard Conservancy – India Trust, SLC-USA, and the wildlife department to favorably turn local attitudes toward this elusive predator. Now these villagers are earning far more income from tourism-related activities than from herding sheep or goats, which all too often end up in the cat’s belly. Many households have abandoned keeping small livestock, thereby lessening the pressure on the sparse and fragile vegetative cover, and leaving more forage for blue sheep, the snow leopard’s natural prey. Using the new found cash to send their kids to good schools, they no longer feel the need to throw stones at or otherwise harass snow leopards—who in turn have become remarkably habituated to human presence. 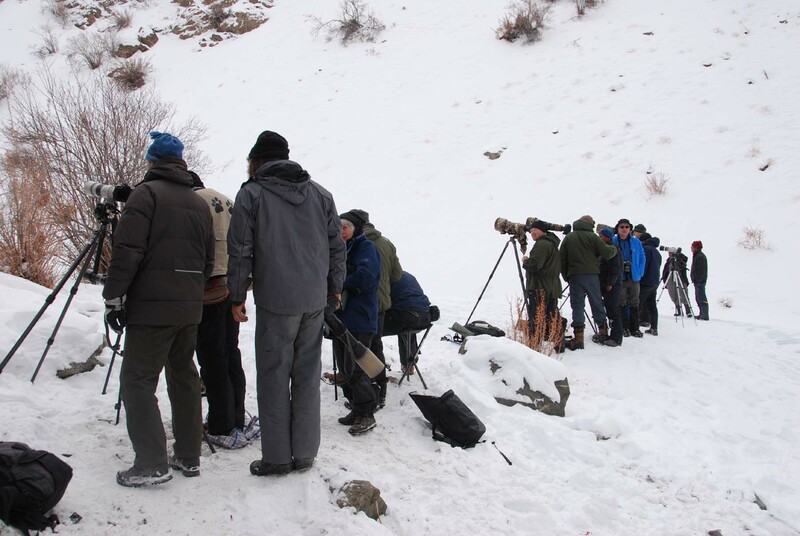 Not so long ago, it would have been a dream to see just one snow leopard during a 10-day winter snow camp, but last year our group had four sightings, and this group ended up with seven. This is a testament to conservation action, but there are simply no words to express my sense of awe and privilege when this Asian mountain ghost comes into the presence of humans and allows us to marvel at her sheer beauty and superb adaptation for living in this steep, cold mountain desert.